The exciting new COTEK “SE” Series inverters are currently being introduced as development continues. 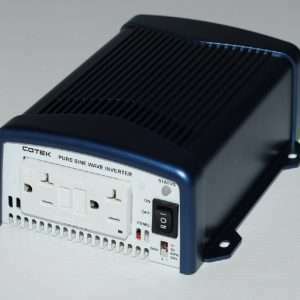 Models are available in 12V/24V/48VDC from 350 watts to the larger and more powerful models of pure sine-wave power inverter. Advanced multistage power saving control function, additional protections and wider working temperatures are a few of the additional features. The “SE” series pure sine wave inverters are being designed to meet industrial and commercial needs. They satisfy the highest demands of safety and reliability and any AC device can be connected to them. As well as its modern design and advanced technical features, the “SE” series inverters are economical and easy to use.